RAWALPINDI – Awami Muslim League (AML) Chief Sheikh Rasheed has expressed his utter disappointment after developments this week informed him that it is someone else and not he who is the faith healer of Pakistan Tehrik-e-Insaf (PTI) Chairman Imran Khan. Talking exclusively to The Dependent, Rasheed narrated his horrors at being informed that it is someone else who is occupying the position that he though was his. “It is absolutely shocking. I thought I was his faith healer, his spiritual adviser, his…” he broke off midsentence to wipe his tears off during the interview. 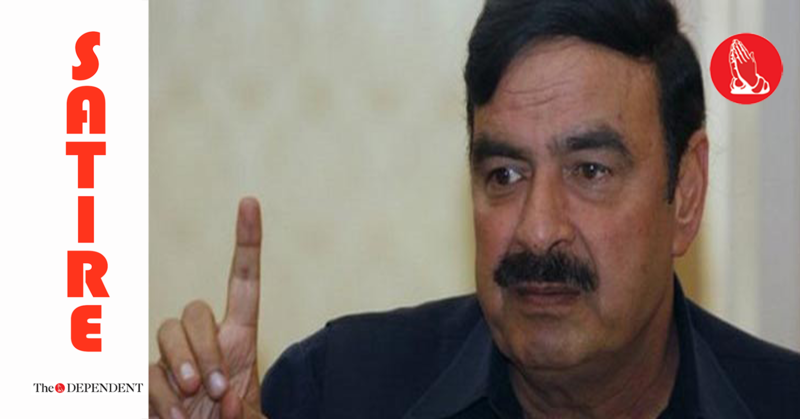 Refusing to give direct replies to questions regarding his political alliance with the PTI or his personal relationship with Imran Khan, Sheikh Rasheed simply said he felt “backstabbed”. “I mean this is the reason why I agreed to… I would never have done him… This is so unfair to me,” he said, without finishing any of his sentences. “Can I just cry and not say anything?” he asked before the interview was called off.